Police authorities in Central province have instructed Kabwe General Hospital – KGH not to release the cause of death certificate to the family of Kelvin Kabango who was brutally murdered by police officers at Landless corner in Chisamba. Kabango, a youthful farm worker was detained at Landless police post for allegedly stealing some farming equipment from the farm where he was working. While in detention about two weeks ago police officers brutally battered him to the extent of bleeding in the nose, mouth and ears. Having seen the extent of the injury caused, Kabango was rushed to KGH where he continued coughing blood due to injuries and later died. He was buried in Chisamba but to date there has been no certificate of death given to the family and efforts by family members to get it have drawn serious intimidation from deputy commissioner of police in Central province Yobe Luhana. The police earlier tried to manipulate the post-mortem by trying to block the family members from witnessing and thereby hide the findings but the family put up a strong resistance. Police have since declared the family as hostile and do not want to attend to them. And a source at KGH said that the post-mortem shows that Kabango died of a punctured lung, broken ribs and shattered skill resulting from being hit with suspected metallic substance. 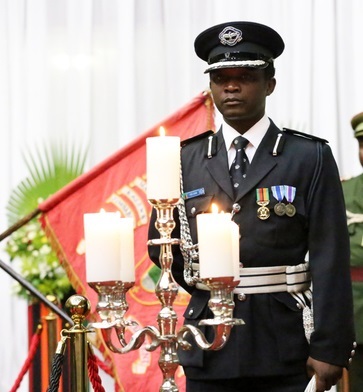 Kabango’s murder by police happened about two weeks earlier than that of ZAF soldier Flight sergeant Nchimunya Choongwa.